These are actual physical cards, not a longer book, with one program or idea per card. For younger kids it's the perfect way to introduce them to the different concepts and tools inside Scratch Jr. My (then) 6yr old loved them. He was able to build little games and learn conditional logic quite easily. The set comes with 75 cards divided into three groups. The first 40 walk your child through a story about the Scratch kitten, programming everything to guide the character through his day. 20 cards cover different details of the programming interface, and 15 are unplugged screen free creative activities. When I tell parents about Scratch and Scratch Jr, they So what age are they for? That's tricky. It depends *entirely* on the particular child. My 6 loves math and science and reading, but getting him to sit down with the iPad and *not* play a game was a challenge when he was 5 (the recommended minimum age for Scratch Jr). It was only when he was about 6 that he got into it. He then sped through Scratch Jr thanks to the cards and has started to tackle Scratch. I think that some kids can do these card tasks on their own and others need parental encouragement. It depends entirely on your child's own nature. So, are Scratch Jr Coding Cards worth it? Yes! 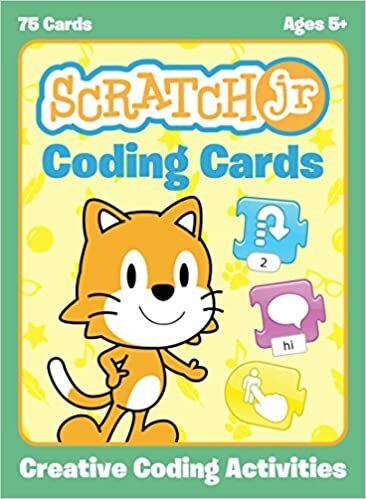 Scratch Jr Coding Cards at No Starch Press.